24 October 2006: Chernobyl in the Ukraine, Linfen in China and Ranipet in India are among the ten most-polluted locations in the world, according to research carried out by the New York-based Blacksmith Institute. The top ten also includes three sites in Russia, one in Peru and one in Zambia. The biggest pollutants were heavy metals and long-lasting chemicals, say the authors of the research study. The World Bank estimates that 16 of the 20 most polluted cities in the world were in China. 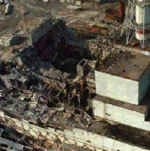 Although it has been 20 years since the nuclear melt down, Chernobyl, is one of the top-ten. Still, most of the most-polluted places are little-known, even in their own countries. Most of the people affected are exceedingly poor. Russia leads the list of eight nations, having itself three of the 10 worst polluted sites. Other sites were chosen because they served as examples for problems found all around the globe. Haina, Dominican Republic has severe lead contamination as the result of battery recycling - a problem common throughout poorer countries. Linfen, China exemplifies many Chinese cities choking on their industrial air pollution. India is represented by a nasty example of serious groundwater pollution by heavy metals. "Living in a town with serious pollution is like living under a death sentence. If the damage does not come from immediate poisoning, then cancers, lung infections, mental retardation, are likely outcomes," the report states. "There are some towns where life expectancy approaches medieval rates, where birth defects are the norm not the exception. In other places children's asthma rates are measured above 90 per cent, or mental retardation is endemic," the report continues. "In these places, life expectancy may be half that of the richest nations. The great suffering of these communities compounds the tragedy of so few years on earth." The report observes that there were potential remedies for these sites. “Problems like this have been solved over the years in the developed world, and we have the capacity and the technology to spread our experience to our afflicted neighbours." Potentially affected people: Initially 5.5 million, now disputed levels of effect. Site description: The world's worst nuclear disaster took place on April 26, 1986, when testing in the Chernobyl power plant, 62 miles north of Kiev, triggered a fiery melt-down of the reactor's core. Thirty people were killed in the accident, 135,000 evacuated, and one hundred times more radiation than the atom bombs dropped over Hiroshima and Nagasaki was released. To this day, the 19-mile exclusion zone around the plant remains uninhabitable. Within seven months, the reactor was buried in a concrete casing designed to absorb radiation and contain the remaining fuel. However, the sarcophagus was only meant to be a temporary solution and designed to last 20 or 30 years. A program to re-contain the site is underway. One major reason for the concern is that though an enormous amount of radiation was released during the disaster, most of the radioactivity remained trapped within the plant itself. Some estimate that more than 100 tons of uranium and other radioactive products, such as plutonium, remain to be released if there is another accident. Chernobyl is also thought to contain some 2,000 tons of combustible materials. Leaks in the structure lead experts to fear that rainwater and fuel dust have formed a toxic liquid that may be contaminating the groundwater. Thyroid cancer in children surrounding this area is a main health problem. Over 4,000 thyroid cases had been diagnosed since 2002. Most of these cases have been attributed to elevated concentrations of radioiodine found in milk. It is hard to project lethal cancer rates and other health risks associated with this fallout. What is known is more than five million people currently inhabit the affected areas of Belarus, Russia, and Ukraine. Furthermore, from 1992 to 2002 in Belarus, Russia and Ukraine more than 4,000 cases of thyroid cancer were diagnosed among those who were children and adolescents at the time of the accident, the age group 0-14 years being most affected. A recent WHO report has indicated that the impact on future generations from radioactivity is now quite low. However this report has been met with skepticism from local and international experts. Cleanup activity: Expert groups such have carried out work on health impacts, remediation effects, and socioeconomic status of the region surrounding Chernobyl. Plans for the 19-mile exclusion zone to be recovered for restricted industrial uses remain but an appropriate environmental impact assessment needs to be finished. Also, implementation of an integrated radioactive waste management program to ensure consistent management and facility capacity needs to be assessed before further development. Costs for remedial action can only be estimated, and experts have predicted these at hundreds of billions of dollars. To date, the costs of the cleanup have placed significant financial burdens on Belarus, Russian Federation, and Ukraine. Type of pollutants: Chemicals and toxic byproducts from Cold War-era chemical weapons manufacturing, including Sarin, VX gas, lewisite - the poisonous effect of which is owed to its arsenic trioxide content, yperite (mustard gas), prussic acid, phosgene, dioxins and other persistent organic chemicals. Lead, from an additives manufacturer, now closed. Site description: In Dzerzhinsk, a significant center of the Russian chemical manufacturing, the average life expectancy is 42 years for men and 47 for women. Until the end of the Cold War, the city was among Russia's principal production sites of chemical weapons. According to figures from Dzerzhinsk's environmental agency, from 1930-1998, almost 300,000 tons of chemical waste were improperly disposed of. Of this waste, around 190 separate chemicals were released into the groundwater. These chemicals have turned the water into a white sludge containing dioxins and high levels of phenol - an industrial chemical which can lead to acute poisoning and death. These levels are reportedly 17 million times the safe limit. The city draws its drinking water from the same aquifers into which these old wastes and unused products were pumped. Now that many of these industries are no longer in operation, the local groundwater has risen, along with the water level in the canal. This rise in the canal's water level threatens to dump arsenic, mercury, lead and dioxins into the Oka river basin, a source of drinking water for the nearby city of Nizhny Novgorod. Despite the heavy toll on the population's health, a quarter of the city's 300,000 residents are still employed in factories that turn out toxic chemicals. According to a 2003 BBC report it is the young who are most vulnerable. In the local cemetery, there are a shocking number of graves of people below the age of 40. In 2003 it was reported that the death rate exceeded the birth rate by 2.6 times and it is easy to see why. The dioxins that get into the water as a by-product of chlorine production are reported to cause cancer even in minute doses. Cleanup activity: Following the support of a baseline research project in the area in 2004, Blacksmith, in cooperation with the local government, has funded the installation of water treatment systems in Pyra (population 4,000), and Gavirolvka, settlements whose groundwater is highly polluted, yet remains the sole source of drinking water. In addition, Blacksmith has funded the establishment of a steering committee led by a local NGO (DRONT) in cooperation with the Nizhniy Novgorod municipal government, to begin the design of a large-scale remediation and pollution mitigation plan for the entire affected area. Site description: This highly populated area known as Bajos de Haina is severely contaminated with lead from a closed down automobile battery recycling smelter. The Dominican Secretary of Environment and Natural Resources, since its creation in 2000, has identified Haina as a national hotspot of significant concern. Various studies have found alarming lead levels in the Haina community, with blood and soil levels several orders of magnitude over regular limits. The contamination is caused by the past industrial operations of the nearby Metaloxa battery plant. Although the company has moved to a new site (which is contaminating a new neighborhouod, albeit less populous), the contamination still remains. The most common symptom of Haina's pollution is lead poisoning, which affects children's health and development. A study revealed that at least 28 per cent of the children required immediate treatment. The children were also at risk for severe neurological consequences at the time of the study. Cleanup activity: In early planning stages, with Blacksmith Institute advice and support. Note: This site is included in the Top Ten as an example of lead battery re-processing facilities. These factories can be found in many major third world cities, and often leave a legacy of lead poisoning in their host communities. Haina is the most severely polluted site of this kind known to Blacksmith Institute. Site description: Kabwe, the second largest city in Zambia is located about 150 kilometers north of the nation's capital, Lusaka. On average, children's' blood levels in Kabwe are 5 to 10 times the allowable EPA maximum. It is one of six towns situated around the Copperbelt, once Zambia's thriving industrial base. In 1902, rich deposits of lead were discovered here. Ore veins with lead concentrations as high as 20 per cent have been mined deep into the earth and a smelting operation was set up to process the ore. Rich deposits of sulphide ore consisted of silicates, oxides and carbonates of lead, which averaged 34% in lead concentration. Mining and smelting operations were running almost continuously up until 1994 without the government addressing the potential danger of lead. This smelting process was unregulated during this period and these smelters released heavy metals in dust particles, which settled on the ground in the surrounding area. The mine and smelter is no longer operating but has left a city poisoned from debilitating concentrations of lead in the soil and water from slag heaps that were left as reminders to the smelting and mining era. Cleanup activity: After decades of contamination, the clean-up strategy for Kabwe is complex and in its primary stages. The first step is to educate the community about the risks of lead poisoning and their susceptibility to the pollutant. Precautionary measures have been taken in order to educate the population about the problem and to provide simple, concrete advice to avoid poison (such as to prohibit children from playing in the dirt and to rinse dust from plates and food etc.). Some areas of Kabwe require drastic remediation in which some entire neighbourhoods may need to relocate. Type of pollutants: Lead, copper, zinc, and sulfur dioxide. Site description: Since 1922, adults and children in La Oroya, Peru - a mining town in the Peruvian Andes and the site of a poly-metallic smelter - have been exposed to the toxic emissions from the plant. Currently owned by the Missouri-based Doe Run Corporation, the plant is largely responsible for the dangerously high blood lead levels found in the children of this community. Ninety-nine percent of children living in and around La Oroya have blood lead levels that exceed acceptable amounts, according to studies carried out by the Director General of Environmental Health in Peru in 1999. Lead poisoning is known to be particularly harmful to the mental development of children. Sulfur dioxide concentrations also exceed the World Health Organization emissions standards by ten fold. The vegetation in the surrounding area has been destroyed by acid rain due to high sulfur dioxide emissions. To date, the extent of soil contamination has not been studied and no plan for reduction of emissions has been agreed or implemented. Cleanup activity: Peru's Clean Air Act cites La Oroya in a list of Peruvian towns suffering critical levels of air pollution, but action to clean up and curtail this pollution has been delayed for the 35,000 inhabitants. In 2004, Doe Run Corporation asked the government for a four-year extension to the plants environmental management plan. A concerted NGO movement is now underway to pressure the company and the government to develop effective strategies for implementation of site remediation agreements and to provide health care for affected residents. Potential population affected: 200,000 Type of pollutants: Fly-ash, carbon monoxide, Nitrogen oxides, PM-2.5, PM-10, Sulfur dioxide, volatile organic compounds, arsenic, lead. Site description: When asked to comment on the environmental conditions of Linfen, one environmental expert quipped, "If you have a grudge against someone, let this guy become a permanent citizen of Linfen! Why? For punishment!" Shanxi Province is considered to be the heart of China's enormous and expanding coal industry, providing about two thirds of the nation's energy. Within it, Linfen has been identified as one of Shanxi's most polluted cities with residents claiming that they literally choke on coal dust in the evenings, according to a BBC report. China's urgent need for coal has led to the development of hundreds of often illegal and unregulated coal mines, steel factories and tar refineries which have diverted water and parched the land making farming in the province nearly impossible. Water is so tightly rationed that even the provincial capital receives water for only a few hours each day. The Annual Report on Environmental Management and Comprehensive Improvement in Key Cities for Environmental Protection in 2003, by the State Environmental Protection Administration (SEPA), indicated that Linfen is the city with the worst air quality in China. The high levels of pollution are taking a serious toll on the health of the Linfen's inhabitants. Local clinics are seeing growing cases of bronchitis, pneumonia, and lung cancer. Lead poisoning was also seen at very high rates in Chinese children in the Shanxi Province. One resident was quoted in the BBC report claiming, "I feel like my throat is very dry, and the stuff coming out of my lungs is black." The severity of the air pollution in the cities of Shanxi is indicated by the fact that the levels of SO2 and other particulates in the air exceed many times over the standards set by the World Health Organization. A growing number of resident deaths in recent years have been directly linked to this intense pollution. Another epidemic found in this province is Arsenicosis, an environmental chemical disease caused by drinking elevated concentrations of arsenic found in water. Chronic exposure to this toxic chemical result in skin lesions, peripheral vascular disease, hypertension, blackfoot disease, and high risk of cancers. One study of Shanxi's well water published in Toxicology and Applied Pharmacology, found the rate of unsafe well water in the province to be 52 per cent - an alarming statistic. Worrying data such as this has caused the Chinese government to openly admit that one in five of its citizens lack safe drinking water. Compounding the pollution problem is the city's economic dependence on the coal, steel, and tar industries as well as China's need for these resources in keeping with its rapidly growing economy. As with many environmental problems in China, strong resistance from business interests and corrupt officials has made improvement difficult to imagine in a short timeframe. Cleanup activity: Information on progress towards cleanup in this area is not currently readily available. Note: Linfen acts in the top ten as an example of highly polluted cities in China. In terms of air quality, the World Bank has been quoted as estimating that 16 of the 20 most polluted cities in the world were in China. Type of pollutants: Radioactive uranium mine tailings. Gamma radiation from the dumps measures in between 100-600 micro-roentgens per hour. Heavy metals, and cyanides. Site description: There are twenty-three tailing dumps and thirteen waste rock dumps scattered throughout Mailuu-Suu, home to a former Soviet uranium plant. From 1946-1968 the plant produced and processed more than 10,000 metric tons of uranium ore, products which were eventually used to produce the Soviet Union's first atomic bomb. What remains now are not atomic bombs, but 1.96 million cubic meters of radioactive mining waste that threatens the entire Ferghana valley, one of the most fertile and densely populated area in Central Asia. Due to the high rates of seismic activity in the area, millions of people in Central Asia are potentially at risk from a failure of the waste containment. Natural hazards such as earthquakes, landslides, and mudflows, all have the potential to exacerbate problems associated with the location and mismanagement of these tailing piles. It is feared that a landslide could disturb one of the dumps and either expose radioactive material within the core of the enormous waste piles or push part of them into nearby rivers. This fear that was nearly realized in May of 2002 when a huge mudslide blocked the course of the Mailuu-Suu river and threatened to submerge another waste site. In April of 2006 the Obschestvenny Reiting newspaper reported that about 300,000 cubic meters of material fell into the Mailuu-Suu River near the uranium mine tailings, the result of yet another landslide. Events such as these could potentially contaminate water drunk by hundreds of thousands of people in the Ferghana Valley, shared by Kyrgyzstan, Uzbekistan and Tajikistan. The poor design and management of the waste areas also allows transfer of some material from these piles to surrounding areas by runoff. Research has found some groups getting very high doses of radon probably due to use of this runoff water in agricultural practices. Risk analyses have also been conducted to assess the radioactive contamination that could occur with more natural disasters, and have found these could lead to potential large-scale environmental contamination. A 1999 study conducted by the Institute of Oncology and Radioecology showed that twice as many residents suffered from some form of cancer than in the rest of the country. Cleanup activity: The World Bank has begun a project for Kyrgyzstan to "minimize the exposure of humans, livestock, and riverine flora and fauna to radionuclide associated with abandoned uranium mine tailings and waste rock dumps in the Mailuu-Suu area". The project includes uranium mining wastes isolation and protection, improvement to the national system for disaster management, preparedness and response and the establishment of real-time monitoring and warning systems, seismic stations and sensors. The total cost of the project is 11.76 million U.S. dollars, of which 6.9 million dollars will be provided by the bank's International Development Association, an institution that gives aid to the world's poorest countries. Type of pollutants: Air pollution - particulates including Strontium-90, Caesium-137, Sulfur dioxide, heavy metals (nickel, copper, cobalt, lead, selenium), particulates, nitrogen and carbon oxides, phenols, hydrogen sulfide. Site description: An industrial city founded in 1935 as a slave labor camp, the Siberian city of Norilsk, Russia is the northernmost major city of Russia and the second largest city (after Murmansk) above the Arctic Circle. According to the Mines and Communities website the city is considered one of the most polluted places in Russia - where the snow is black, the air tastes of sulfur and the life expectancy for factory workers is 10 years below the Russian average. This city houses the world's largest heavy metals smelting complex, and over 4 million tons annually of cadmium, copper, lead, nickel, arsenic, selenium and zinc are dispersed into the air. Mining and smelting operation started in the 1930s, and is the worlds largest nickel producer. Norilsk Nickel, a recently privatized firm, is one of Russia's leading producers of non-ferrous and platinum-group metals. It controls one-third of the world's nickel deposits and accounts for a substantial portion of the country's total production of nickel, cobalt, platinum, and palladium. It is also a major polluter, ranking first among Russian industrial enterprises in terms of air pollution. Due to the geographic location, reports on ecological impacts and contamination are infrequent from this location. In 1999, a report found elevated copper and nickel concentrations in soils up to a 60 km radius. The city population has been affected by air quality in this region of smelters, where it has been shown over half of all samples exceed the maximum allowable concentrations for both copper and nickel. A report in 1995 indicated that high levels of respiratory diseases have been observed in children around this area, and that these are most likely related to the air pollution from the smelter activity. Investigations evaluating the presence of ear, nose and throat disease among schoolchildren revealed that children living near the copper plant were twice as likely to become ill than those living in further districts. Similarly, children living near the nickel plant were shown to become ill at a rate 1.5 times higher than children from further districts. Analysis also showed that problems during the last half of pregnancy as well as premature births were much more frequent in Norilsk than in the Taimyr and Kransnoyark regions. Furthermore, mortality from respiratory diseases is considerably higher than the average in Russia, which is 28/1000 or 15.8% of all deaths among children. Since November 2001, Norilsk has been shut to foreigners, one of 90 "closed towns" in Russia where Soviet-levels of secrecy persist. Cleanup activity: Many groups, some supported by international donors, have tried to address the problems. 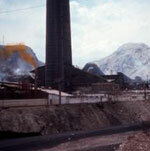 In the 1980's emission reductions were tried by building dust and gas removal facilities, and also electrostatic precipitators and liquid phase sulfur removals. These technologies aided in sulfate reduction, but studies proved that damage to forests and concentrations of metals remained a significant problem to date. Site description: Ranipet is located about 100 miles upstream from Chennai, the fourth largest urban area in India. Although Ranipet is a medium sized town, its problems also pose a potential risk to the population of the nearby city of Vellore. A factory in Ranipet manufactures sodium chromate, chromium salts and basic chromium sulfate tanning powder used locally in the leather tanning process. The Tamil Nadu Pollution Control Board (TN PCB) estimates that about 1,500,000 tons of solid wastes accumulated over two decades of plant operation are stacked in an open yard (three to five meters high and on 2 hectares of land) on the facility premises and contaminating the groundwater. The contamination of the soil and groundwater with wastewater, as well as run off from solid wastes has affected the health, resources, and livelihood of thousands of people. In a residential colony about 1 kilometer from the factory. Three open wells, a dozen bore wells and about 25 public hand pumps have been abandoned due to high chromium levels in the water. Agricultural land about a kilometer from the factory has also been affected. There is widespread fear that if this pollution is left unchecked, the Palar basin, the main drinking water source in the region, could also be contaminated. Indian farmers who have the misfortune of cultivating this toxic land claim that the toxic waste from the nearby tanneries degrades the fertility of the land citing that " invariably, only one in five crops does well." Farmers also complain of the foul smells which emanate from the very water they use to irrigate their fields claiming that, "when we come in contact with the water we get ulcerations on our skins and it stings like an insect bite." Cleanup activity: In 1996 the government shut down Tamil Nadu Chromates & Chemicals Limited (TCC), the factory responsible for an estimated 1.5 million tons of untreated chromate sludge. In May 2005 Blacksmith Institute visited this site. The Tamil Nadu Pollution Control Board authorities have assigned the National Geophysical Research Institute (NGRI) and National Environmental Engineering Research Institute (NEERI) to design and implement remediation plans to cleanup this site. An effective solution to tackle the issue of chromate leaching from the legacy site would be to encapsulate the waste dumpsite to prevent further leaching and treating the subsurface soil of the channel-flows. Site description: Dalnegorsk and Rudnaya Pristan are two towns in the Russian Far East whose residents suffer from serious lead poisoning from an old smelter and the unsafe transport of lead concentrate from the local lead mining site. Data suggests that drinking water, interior dust, and garden crops also likely contained dangerous levels of lead. Since 1930 there has not been any attempt to address associated health concerns by either an educational or a technical environmental program. Residents of the area were simply left to deal with their health risk problems on their own and are largely unaware of the risks. Furthermore, some residents in Rudnaya use old casings of submarine batteries that were recycled by the smelter in order to collect precipitation for watering their gardens. Cleanup activity: The lead smelter has now been voluntarily shut down, after Blacksmith presented the owner with data on the health risks to children of lead contamination. In addition, children's blood lead levels are being tested, and those with elevated levels are being treated with Blacksmith funding. This funding has also supported a programme of education to all residents, and local education and testing through the community is ongoing. Next, a plan to remediate the worst of the contamination needs to be drawn up and implemented. The urban areas of Europe, North and South America as well as Asia are some the world’s major producers of nitrogen dioxide (NO2) pollution. Other significant polluters are the coal-fired power stations of South Africa and bio-mass burning in other parts of the African continent. Heavily used shipping lanes such as the Red Sea also contribute significantly to the earth’s man-made pollution. These are some of the findings of 18 months of observations by the European Space Agency (ESA) satellite Envisat. The images produced by Envisat make clear the impact of human activities on air quality and the spread of urban pollution.